An affordable package with a western ambiance to it. Located in the heart of the Madison Valley only 15 minutes south of Ennis, Montana, and only a five-minute drive to the legendary Madison River. Guide, lunch, non alcoholic beverages, all your tackle including flies, leaders and tippet, and the use of the guides rods if you do not have your own. Complementary dinner each night at the onsite restaurant (NOT AVAILABLE ON MONDAYS) . Built in the 1940s, these 6 cozy log cabins sleep anywhere from one to six guests and are within walking distance to the onsite restaurant, general store, and saloon. 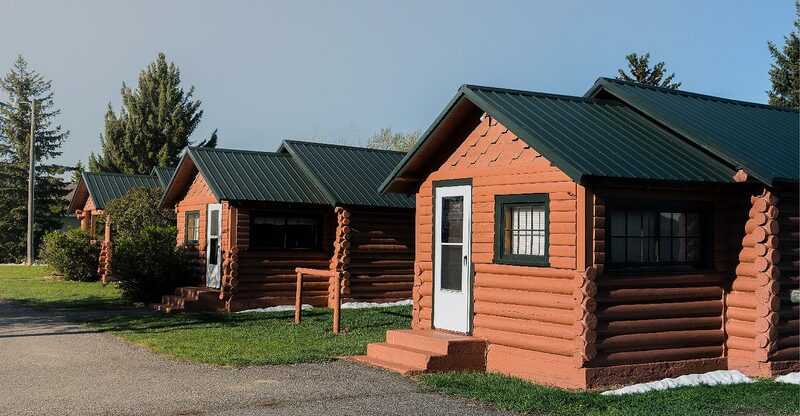 All cabins feature newly remodeled bathrooms, kitchenettes, and wifi to make your stay as comfortable as possible. The Blue Moon staff prides itself in extreme attention to detail and cleanliness. These quaint accommodations are great for groups of anglers, couples, and families. Referred to as a “roadhouse” by area ranchers, the property is located in the heart of Montana’s wildest country, a stone’s throw from US Highway 287, and near some of the best fishing and hiking access in the country. Only 50 minutes to the west entrance of Yellowstone National Park. Package deals are only valid if cabins are still available at Blue Moon Saloon. Complimentary dinners will be valid at the onsite restaurant next to the saloon, walking distance from the cabins. All guided trips will be from Earthquake Lake to the Headwaters of the Missouri River. This package is not valid on the Madison River in Yellowstone National Park. Guide Gratuity – Gratuity is a major part of the guides income, and is well appreciated to help with the guide’s fuel, flies lost on the trip, and reflects the hard work of the guide. Average gratuity is $100-$150 per guide, per trip. However, if you feel the guide deserves more or less, please adjust the amount according to your experience. Airport Transfer – We can arrange airport transfers for an additional cost of $260 for the first 2 in a round trip shuttle plus an additional $40 per person beyond the first 2 up to a max of 5 per van). Transaction Fee – All credit or debit card payments add 3% to the total amount. A 50% deposit is required to secure a reservation within 7 days of booking. In case of a cancellation, the deposit is fully refundable less a $200 processing fee per person if the written cancellation request is received prior to 90 days of the arrival date. For cancellations within 90-60 days of arrival, the deposit is non-refundable. Requests to move a scheduled trip date are the same as canceling and re-booking. The balance of the trip is due within 60 days of the trip. If a cancellation must be made within 60 days of arrival no refund will be made on payments. Please understand that these trips are difficult to re-book on short notice, and that our focus is on providing the best fishing experience possible. If you have any concerns about attending your booked trip, please look into trip insurance. Just a little note to let you know that Rob & I had a great time. The lodging at Blue Moon Saloon was so nice. The cabin was cozy & comfortable, the food & beer were so tasty and Darcy & her crew were wonderful. The float/wade trip was so much fun. Never having been on one we didn’t know what to expect, it was better than we could have ever imagined. John Kirk was a great guide!!! Very knowledgeable and professional. I was so nervous..he put me at ease right away. So helpful and patience…I really learned a lot too! It was a beautiful day on the river... catching fish… laughing… just enjoying everything!!! We would do it again in a heart beat!! and also Darcy and the Blue Moon Saloon gang.